It looks like the door may be open for Wesley Snipes to return as Blade in the modern Marvel universe. What form that may take and when it may actually happen? 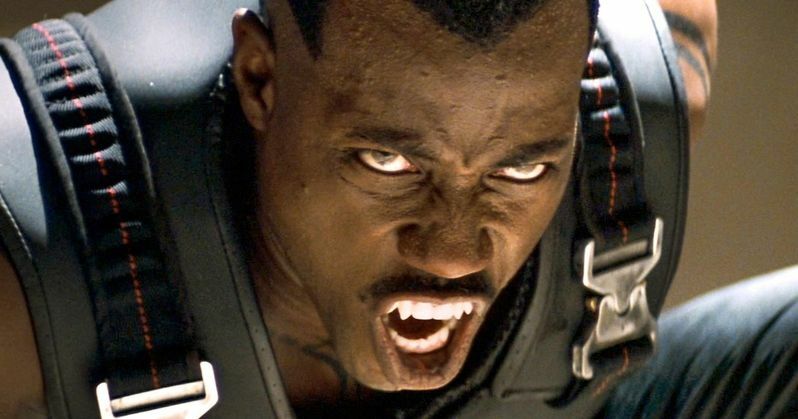 That's still totally up in the air, but Snipes recently revealed that his team has had conversations with the brass at Marvel about bringing back Blade the Vampire Hunter. The first Blade recently celebrated its 20th anniversary. In an age long before the Marvel Cinematic Universe as we know it, Wesley Snipes helped to legitimize comic book movies. During a recent interview in honor of the movie's anniversary, the actor revealed that he's had conversations about some new possible Blade projects, two to be exact, that would, as he puts it, perfectly fit into the MCU. One of which could be Blade 4. Here's what he had to say about it. "There are a lot of conversations going around right now and we're very blessed to have the enthusiasm and interest in something coming from that world again. We've created two projects that fit perfectly into this world and, when people see them, I think they're only going to have a problem with deciding which one they love the most." Wesley Snipes has expressed interest in returning to the role in the past. The key difference here is that it appears as though there are actually conversations taking place with Marvel Studios. Now whether or not that's going to be on the big or small screen, if either of these two projects moves forward, remains to be seen. Snipes does promise that what they've cooked up will put the previous movies in the franchise, such as Guillermo del Toro's Blade II and the regrettable Blade: Trinity, to shame. "All the main execs [at Marvel] and my team, we've been discussing for the past two years. Everyone's enthusiastic about it, everybody gets it. But they got a business to run and they gotta square the things that they gotta figure out before they can get to it, I guess. In the meantime, we got a business to run and our own slate of things to do so...But the next time you see something in [the Blade universe], mark my words: what we did before is child's play compared to what we can do now." The trilogy of Blade movies made a total of $415 million at the box office. That may seem like chump change these days, but it was considered pretty good at the time for a comic book movie. Nostalgia for the character mixed with the current popularity of the MCU could be a recipe for success. Once Avengers 4 comes out, the door is wide open for who knows what to happen in the MCU. Why not use that opportunity to bring back Blade? Kevin Feige previously indicated that the character's return was an eventuality, it's just a matter of when or where. As for the who? If Wesley Snipes has his way, it's going to be him once again. You can check out the full interview over at Vice.